Dung Nguyen ’18 (left) and psychology professor Blair Gross watch as Avisha Shah ’18 uses the Oculus virtual reality headset. 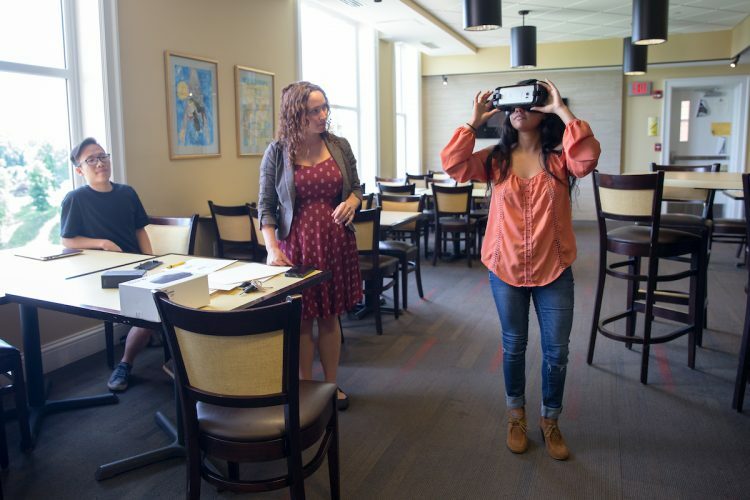 This spring, Randolph psychology professor Blair Gross took one of her classes to a virtual reality lab at the University of Virginia. Students took turns putting on the Oculus headset and walking a plank from the top of a tall building in a virtual world, but no one, including Gross, could bring themselves to find out what would happen if they fell. However, the exhilarating experience did give her ideas for some other ways the technology could be used. This summer, Gross is partnering with Avisha Shah ’18 and Dung Nguyen ’18 on a Summer Research project to examine ways that virtual reality can be used in classrooms both at Randolph and other schools. They are also programming a virtual world that could be used in future psychological research. 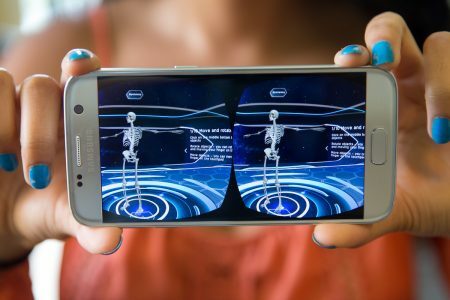 Oculus users can study specific bones in the human body on a 3-D skeleton. Shah, who is a biology major with minors in psychology and chemistry, is focusing on the educational aspect of the project. So far she has been comparing traditional and virtual reality learning techniques, and finding ways to incorporate the technology into lesson plans for various classes. After Randolph, she plans to study radiology in graduate school. Because of its immersive, interactive capabilities, Shah also believes virtual reality classrooms could help students better retain information they learn. She has already seen positive results in her own study habits. “I can use the Oculus for just 10 minutes, and it’s amazing how much of what I do sticks in my memory,” she said. Nguyen, meanwhile, is programming a virtual world for the psychological research portion of the project. He is developing virtual landscapes that will be used to test users’ perception. The psychology major from Vietnam plans to one day enter a career in digital programming or quantitative psychology. Even though he had little prior experience with programming, Nguyen enjoys the challenges of learning about something new. 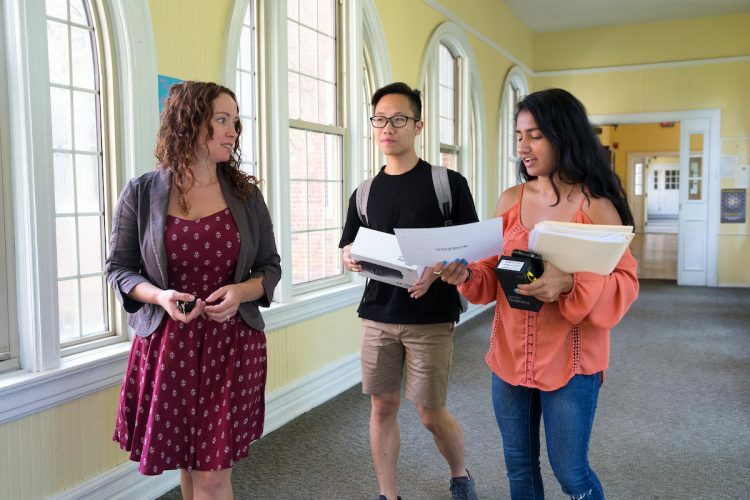 Psychology professor Blair Gross, Dung Nguyen ’18, and Avisha Shah ’18 walk and talk about their project.